Kaplan Turbine is an axial flow reaction turbine with adjustable blades. This turbine was developed in the year 1913 by Viktor Kaplan, who was a Austrian Professor. In his design, he combined automatically adjusted propeller blades and automatically adjusted wicket gates to obtain efficiency over a wide range of water flow and water level. 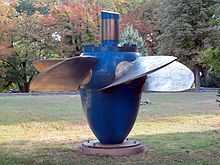 It is also called as propeller turbine and evolved from the Francis Turbine. 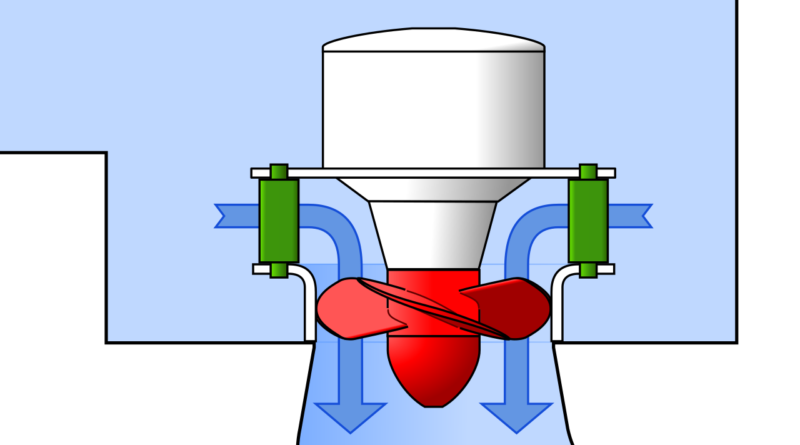 It is capable of working at low head and high flow rates very efficiently which is impossible with Francis turbine.The working range of head at which the Kaplan turbine works more efficienlty is 10 to 70 m.
Since it is a reaction turbine, so the reaction force of leaving water is used to turn the runner of the Kaplan turbine, As the water flows through the twisted blades a lift force is generated in the opposite direction of the leaving water and that lift force causes the blades to rotate. It is a spiral type of casing that has decreasing cross section area. The water first enters into the scroll casing and then it moves through it to the guide vanes and finally to the runner blades. It protects the runner, runner blades guide vanes and other internal parts of the turbine from an external damage. Guide vanes are used to direct the water to the runner blades smoothly by decreasing its swirl velocity. 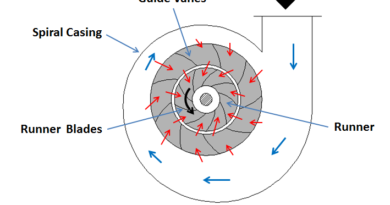 If guide vanes is absent than the turbine can not work efficiently and its efficiency decreases. The guides are adjustable in Kaplan turbine. Its opening and closing depends upon the demand of power requirement. 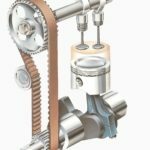 In case of more power output requirements, it opens wider to allow more water to hit the blades of the rotor and when low power output requires it closes itself to cease the flow of water. Runner is the rotating part of the turbine or we can say that it is the heart of the Kaplan turbine. Its shaft is connected to the shaft of the generator. The runner of the this turbine has a large boss on which its blades are attached and the the blades of the runner is adjustable to an optimum angle of attack for maximum power output. The blades of the Kaplan turbine has twist along its length. 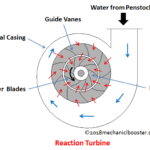 Why twist is given to the blades of the runner in Kaplan turbine? The runner blades has twist along its length in order to have always optimum angle of attack for all cross section of blades to achieve greater efficiency. It is a tube which is used to increases the pressure of the fluid or water that exits the turbine. It has increasing cross section area. Draft tube is used only in reaction turbine. It increases the pressure of the water that leaves the runner blades. 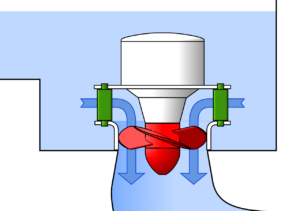 Since the water at exit of the turbine has very low pressure and if its pressure is not increased than the back flow of the tail race water takes which can damage the turbine. So to increase the pressure of the exiting water we uses draft tube. It converts the kinetic energy of the water into pressure energy as it passes through draft tube and the pressure of the water increases. The draft tube has to increases the pressure of the water upto such an extent that it must always greater than the pressure of tail race water and prevents the back flow of water from the tail race to the turbine. 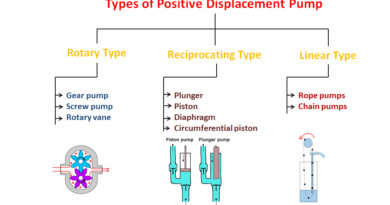 If it does not happens than cavitation may results and causes damage to the turbine. The water from the pen-stock enters into the scroll casing. The water moves into the scroll casing and the guide vanes directs the water from the casing to the blades of the runner. The vanes are adjustable and can adjust itself according to the requirement of flow rate. As the water moves over the blades it starts rotating due to reaction force of the water. The blades in the Kaplan turbine is also adjustable. From the runner blades, the water enters into the draft tube where its pressure energy and kinetic energy decreases. Actually here the K.E. 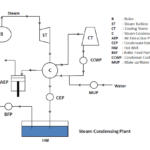 is gets converted into pressure energy results in increased pressure of the water. Finally the water discharged to the trail race. 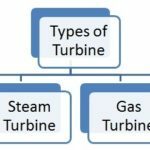 The rotation of the turbine is used to rotate the shaft of generator for electricity production and for some other mechanical work. It can work more efficiently at low water head and high flow rates as compared with other types of turbines. It is easy to construct and space requirement is less. The Efficiency of Kaplan turbine is very high as compares with other hydraulic turbine. Cavitation is the major problem in this turbine. Use of draft tube and proper material generally stainless steel for the runner blades may reduce the cavitation problem to a greater extent. This turbine is used in power generation (mostly electricity) where water is available at low head and at higher flow rates. 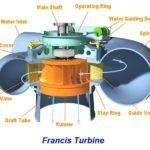 This is the all about Kaplan Turbine. If you find anything missing or incorrect than lets us notify through your valuable comments. And if this article has enhanced some knowledge in you than don’t forget to like and share it on Facebook , Google+, Twitter and on other social medial networks. 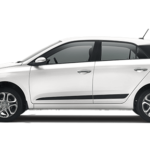 ← History of Automobile – How Modern Automobile Evolved? What is Density, Specific Weight, Specific Volume and Specific Gravity?